Hospitals are supposed to be a safe haven for the sick and injured. They are meant to be a place of shelter in sickness and tough times, but what happens when that safe haven and shelter is rocked from its foundation? On May 22, 2011, an EF-5 tornado shattered the town of Joplin and quite literally rocked St. John’s Mercy Hospital off of its foundation. On what was supposed to be a quiet Sunday evening in the southwest Missouri town, the roof was ripped off the hospital, most windows shattered, the backup generators failed and the building was plunged into total darkness. Lifesaving equipment that required power was rendered useless. Six people died in the hospital that night, five were patients and one was a visitor. Across Joplin, 161 people died as a result of the tornado, and St. Johns hospital was forced to close its doors. As Joplin prepares to mark the three-year anniversary of the tornado, the memories of that time serve as a true lesson in mercy. But looking back is only half the story, because for St. John’s Mercy, a new future is rising just over the horizon. The Sisters of Mercy established the first hospital in Joplin in 1896. The hospital they created was a 10-bed temporary hospital in a borrowed building near Tenth and Virginia. They named it Mercy Hospital. In 1968, the St. Johns Mercy hospital, a nine-story modern building was erected in its place. It stood until that fateful night in May, 2011. Courtesy of Aaron Durall/Mercy Health. 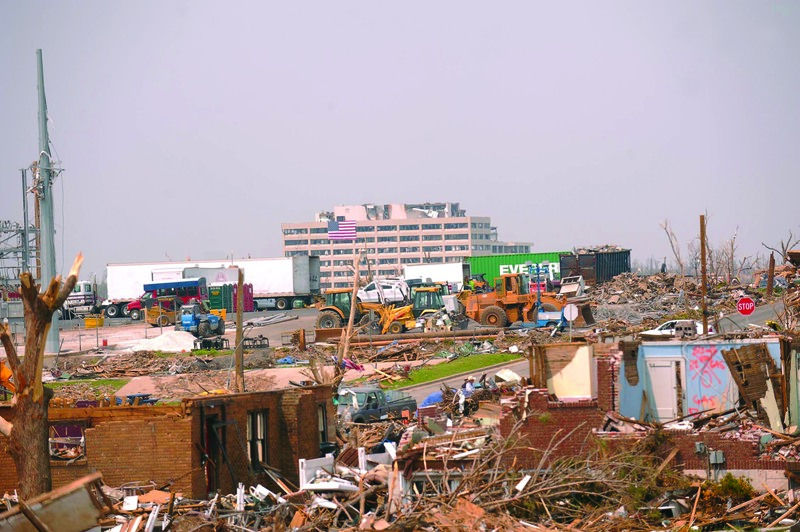 In the aftermath of the tornado, the hospital became a symbol of the town as million watched news broadcasts from the parking lot of the hospital. Images of broken windows, destroyed ambulances and a shredded helicopter filled newspaper covers and TV screens for weeks. 183 patients were in the hospital beds that night, 25 patients in the emergency department, 100 staff on duty and an unknown number of visitors in the patient rooms, halls and waiting areas. After the storm, the hospital was evacuated in 90 minutes and patients were taken to nearby Freeman Hospital in volunteer pickup trucks or triaged in the parking lot. Doctors, nurses and emergency personnel came flooding in to take care of the wounded, but this couldn’t be a permanent solution. In the days after the tornado, it was quickly determined that the building could not be salvaged, and new solutions would have to be created. One of the first decisions that had to be made was what to do about the hospital. Freeman Hospital in Joplin had escaped the tornado relatively unscathed, but the city of 50,000 needed more than one hospital to meet the needs of the population. 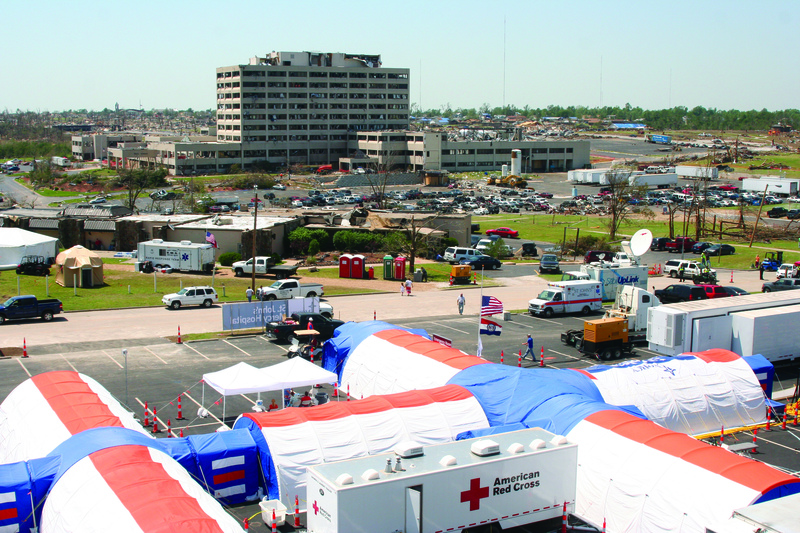 Immediately after the tornado, a military tent MobileHospital2hospital dubbed Mercy M*A*S*H was created. An 8,000 square foot, 60 bed arched tent structure was borrowed from Branson and brought in to the parking lot near the site of the destroyed St. Johns. The makeshift tent hospital was up and running by 7 a.m. the Sunday after the tornado – less than a full week. The tent hospital included an emergency department, pharmacy and mobile surgical units. Equipment was borrowed from other Mercy hospitals to keep the tent hospital going. Everyone involved knew this was not a permanent solution, so modular clinics were set up in portable buildings and Mercy purchased a drug treatment center in Joplin and converted it into a 30 bed facility for behavioral health patients. Before winter came, and after the announcement that Mercy would rebuild the hospital at a new location, officials made the decision to work with a Michigan company that makes modular buildings of Styrofoam compressed between sheets of metal. The company’s portable buildings slowly replaced the tents in the months that followed the tornado. Again, these were a great improvement, but not a permanent solution, so Mercy executives and engineers looked at other options and chose a California firm, Walden Structures, to help them create a modular hospital. This led to 224 modules being shipped cross country on trains and trucks to Joplin. Many of the modules arrived in Joplin almost completely finished, where they were joined together and plumbing and wiring was added in. The finished project was given some final touches and dubbed Mercy Hospital Joplin, and contained 150,000 square feet of space, and emergency department and enough space for 100 patients to say overnight. Mercy Hospital Joplin is the largest modular construction Walden Structures has ever produced. Around 300 local workers were hired to finish the construction of the hospital, including roofers, electricians and other specialized workers. The new facility, which opened to patients in April 2012, allowed the doctors and nurses to do more complex procedures. They were once again able to do open heart surgery, and for the first time since the tornado, deliver babies. This facility can be used for years to come and will continue to serve patients even after the construction of Mercy Joplin is completed. 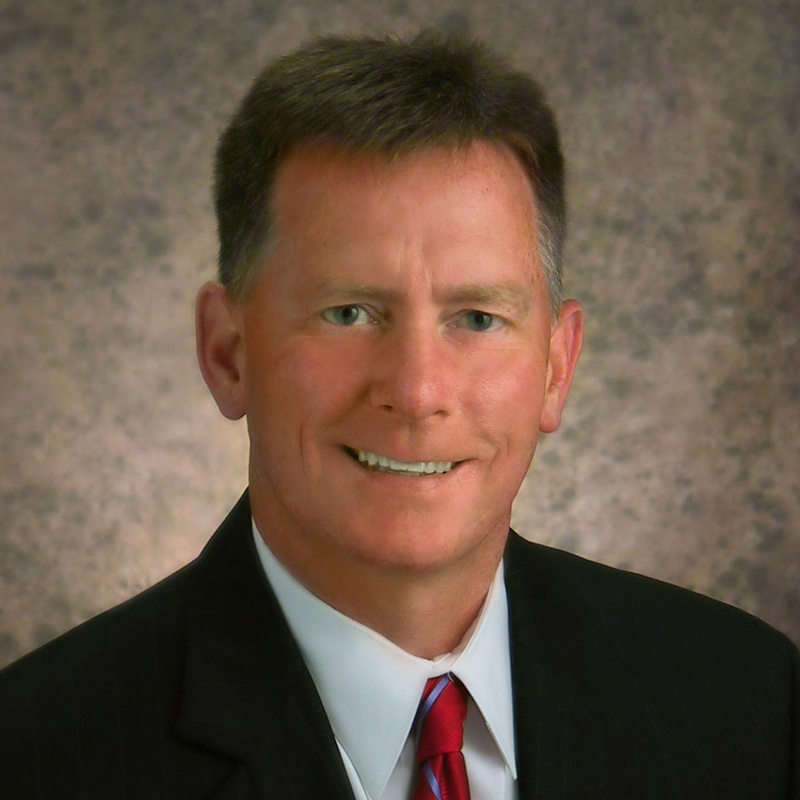 In the immediate aftermath of the tornado, Mercy CEO John Britton made a promise: they would rebuild. It was a snap decision made on the fly and without the approval of his bosses, but he felt it was the right decision, and the board agreed. Mercy also vowed to keep all 2,200 employees on the payroll and find spots for them to work. “That was an incredible decision on their part,” Angella Saparito, media relations for Mercy Hospital, said. “A lot of people could have packed up and moved to other cities and states because their jobs didn’t exist anymore, but Mercy found spots for them in other facilities and it kept them living and working in Joplin. UtilityTunnelatNewMercyHospitalThe plan for the new state-of-the-art hospital came together quickly, and land was purchased near Joplin’s busiest highway where an old college and a few residential houses sat. John Farnen, director of strategic projects for Mercy, who is overseeing the construction of the new hospital, said they were met with very little resistance when they approached the landowners about putting the hospital on that location. Mercy broke ground in January 2012 and cleared more than 100 acres of land for the new hospital campus, while preserving saplings to replant when the hospital is completed. The design of the hospital was fairly simple, so construction could begin as soon as possible and sometimes even before equipment had been picked out for each room. The new hospital, along with the new roads around it, will cost nearly half a billion dollars and will have the latest equipment in its rooms. The new layout will be simple, so it will be harder to get lost in the hallways of Mercy Joplin. The new plan includes four entrances: emergency, clinic, oncology and the main entrance. The oncology department will have the latest technology for their radiology equipment, making it among the most high tech cancer centers in the region. Including the clinics in the hospital floor plan will also have its advantages. No longer with doctors have to drive over from other parts of town to see their hospitalized patients. With the new hospital, it may be as simple as walking down the hall to check up on patients. The new hospital will also come with something new: a neonatal intensive care unit, the first in the region, and something St. Johns did not have. When the hospital is completed at the end of this year, it will be one of the safest hospitals in the Midwest. The walls are created with thick concrete slabs, but have the look of a brick front. Farnen’s concern, however, were the windows. Each floor will have a windowless safe zone, but for rooms with windows, they had to be strong. Such windows didn’t exist, so Farnen’s team contracted with Architectural Wall Systems to make custom windows. They consist of a thicker layer of glass and are coated with a protective glazing and framed into an aluminum curtain wall that is attached to the wall in more ways than a conventional window so they can absorb more shock. After rigorous testing of air canons and 2x4s, and pressure chambers, the glass was able to flex and crack like a car windshield, but not completely break. These windows are tested to withstand wind of 140-250 miles per hour. All emergency lighting will have battery back-up systems to make sure lighting will continue. The facility also is home to three large generators that can keep the hospital up and running at full power for 96 hours until power can be restored. Joplin continues to move forward, including the employees of Mercy Joplin Hospital, but they never forget what was lost in May 2011. The new chapel at Mercy Joplin will house the original Stations of the Cross that survived the tornado. The stained glass that graced the walls of St. Johns will be displayed, and stones from the crumbling walls of St. Johns will be used to make a decorative wall in the chapel. Mercy Joplin is scheduled to open in March 2015 to patients, just under four years after the tornado.